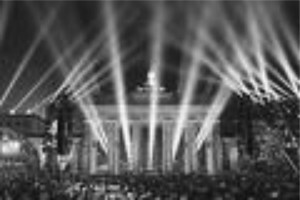 On November 9, 2014, Germany and its Western Allies celebrated the fall of the Berlin Wall and the subsequent re-unification of the two Germanys. 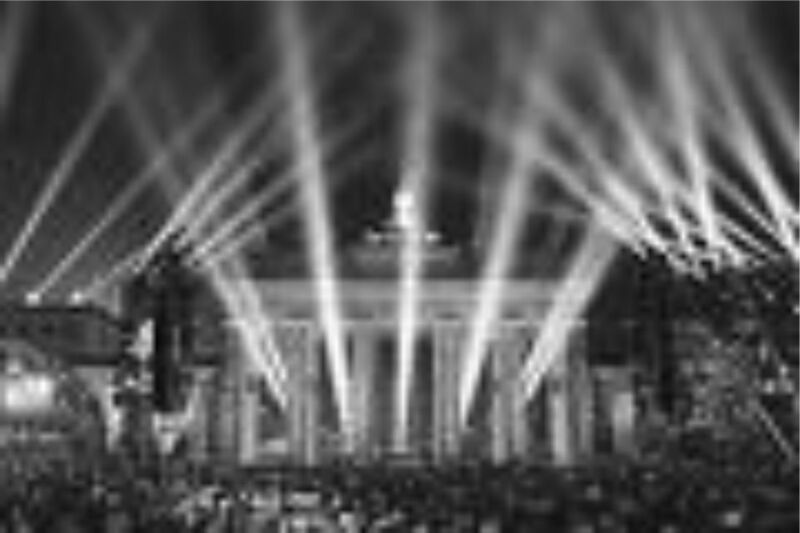 Prime Minister Merkel described the “historic event” as a “victory of freedom for all peoples in Europe and across the world.” The entire Western media and officialdom echoed Merkel’s rhetoric, as 300,000 Germans gathered at the Brandenburg Gate to hail their leader as she spoke of the “one people, one nation and one state in freedom, peace, and prosperity….” But Merkel’s discourse distorts the real consequences of a united Germany. Moreover, the Western celebration of fallen walls is very selective. The notion that Germany was unified democratically is of dubious accuracy. The consequences of a powerful unified Germany have not led to a peaceful prosperous Europe and Germany’s current role in world politics, particularly toward the Middle East, North Africa, and Ukraine, has been anything but peaceful. 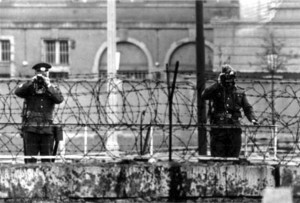 While NATO regimes celebrate the fall of the Berlin Wall as the highest expression of freedom, these same political leaders support, finance, and promote the construction of oppressive walls throughout world: unified Germany and its NATO partners have supported Israel’s Separation Wall dividing and caging millions of Palestinians for the better part of two decades. Apparently there are progressive and reactionary walls—good walls and bad walls. Unlike the Palestinians, Berliners were never deprived of basic necessities and subject to random displacement or even murder—the Western airlift provided all for West Berliners. Israel’s Separation Wall results in division and seizure of Palestinian land, ancestral homes, farms, schools and cultural sites while centuries-old olive groves are razed—depriving their owners of productive income. The U.S. has built its own massive security wall along its Mexican border, incarcerating and even shooting refugees fleeing Washington’s militarization of Central America and Mexico. The U.S. wall condemns millions of Mexicans and Central Americans to live in terror and misery in murderous U.S. client narco-states. In the past 7 years, over 100,000 Mexican civilians have been killed under the reign of U.S.-backed presidents, who were elected through fraud, as they relentlessly pursue the U.S.-mandated War on Drugs. Similar levels of killings have ravaged Honduras, El Salvador, and Guatemala where narco-gangs—with the backing of corrupt political, police, and military officials—terrorize cities and the countryside. The death toll from U.S. military interventions in Central America far exceeds those by the former Soviet Union in Eastern Europe. The U.S. border wall ensures that the survivors of this terror will remain exposed to the brutal rule of U.S.-backed regimes. At the same time, the European Union has erected its land and sea walls against refugees from Iraq, Syria, Libya, Lebanon, and Palestine, fleeing NATO-directed invasions and proxy wars in their countries. According to the UN Commission on Refugees, 13 million civilians have been displaced by U.S. wars in Iraq and Syria. Many fleeing the war zones crash up against European legal walls; migration restrictions, concentration or “internment” camps, and prolonged detentions welcome their flight to freedom. Merkel glosses over the crucial fact that the East Germans were never consulted or allowed to hold a free election to decide what kind of relations they would like with the West German regime. They were never asked under what terms and in what time frame “reunification” would take place. The West German regime seized control and dictated economic and social policies that destroyed their eastern neighbors’ economy by fiat. Hundreds of thousands of East German factory workers faced arbitrary firings as the capitalist West closed state factories. East German farmers looked on helplessly as their prosperous, stable co-operatives were dissolved on the orders of West German officials. Over 1.5 million Eastern German workers were uprooted and became economic refugees in the West where wages were double the rate in liberated East Germany. The wages were higher, but so was the job insecurity and the loss of social welfare provisions of the East. And if the death of 138 East Germans during 28 years trying to escape over the Wall was a tragedy, then what should we call the thousands who have drowned or died other horrible deaths trying to cross the Mediterranean to reach Europe or to scale the Wall separating the U.S. and Mexico or Israel’s Wall strangling six million Palestinians? The scribes and scribblers from the New York Times, the Financial Times and the Washington Post did not mention these real, contemporary walls. The selective denunciation of certain Walls contrasts with the politics of erecting other, more formidable Walls. Western walls of exclusion carry with them a denial of responsibility for the political and economic conditions that has driven millions of refugees to flee Central America, Palestine, the Middle East and North Africa. 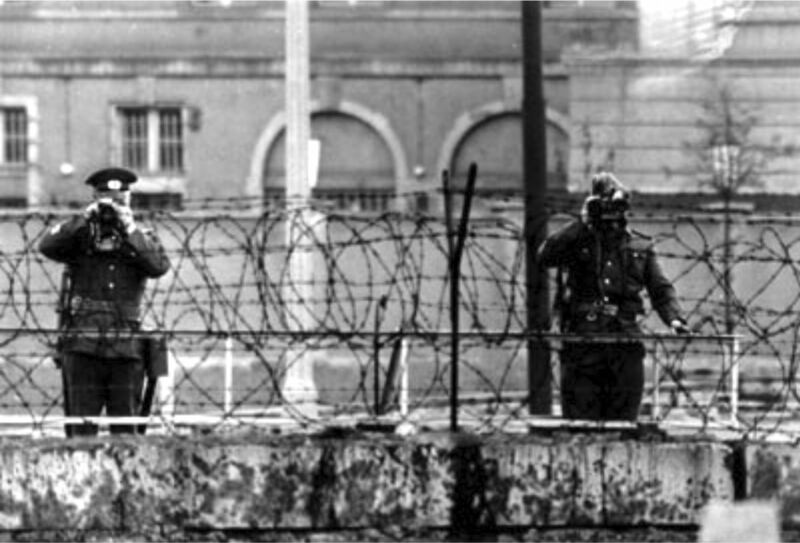 Imperial wars are characterized by the construction and maintenance of complex western walls, far deadlier and brutal than the Berlin Wall and less likely to fall. In fact, western walls are multiplying and being fortified by the latest surveillance technology. Larger budgets and more lethal arms for anti-immigrant police, has led to the brutal hunt, capture and incarceration of refugees—as Western regimes become more like police states. The annexation of East Germany vastly increased the economic power of Germany, providing German capital with several million skilled workers and trained engineers at no cost. Germany’s enhanced power dictated the course of the European Union’s economic policy. With the onset of the economic crisis, Germany’s capitalist and political elite were well positioned to dictate the terms of recovery—and impose the entire burden on the working and middle classes of Southern Europe and Ireland. Germany’s ruling class, in firm control of the EU directorate, forced austerity programs on Greece, Portugal, Spain, Italy and Ireland. These regressive policies, which ensured that creditors would recover their loans with interest, led to spiraling unemployment rates, in some cases of over 50 percent for young people, and long-term, large-scale decline in living standards. Unified Germany flexed its newly found economic muscle and extended its hegemony over the EU and ensured debt payments from its European subjects. Unified Germany’s economic power led to renewed political and military aspirations to engage and assert its presence in the U.S.-led imperial wars in the Middle East, North Africa, South Asia and the Ukraine. By the end of the first decade of the 21st century united Germany was profitably supplying weapons, logistics and military missions in Afghanistan, Syria and Iraq. It provided Israel with weapons and economic aid while Palestinians were expelled from their homes and land. Merkel’s imperial ambitions were revealed in her wholehearted backing of the far-right coup in Ukraine. Subsequently Germany imposed sanctions against Russia and supported the Kiev regime’s savage military blitz against the Donbass. In the Ukraine, Germany once again, as in the 1930s, found allies among neo-Nazi collaborators and thugs willing to slaughter ethnic Russian-speaking federalists in the East. Merkel’s dream is to convert the Ukraine into a German-American client state, where German exports would replace Russian goods and German agro-mineral investors can exploit the country’s raw materials. It is obvious that Merkel, Obama, and other imperialist rulers have a double standard with regard to walls. They denounce Communist Walls while supporting Capitalist Walls against refugees. They celebrate the fall of the Berlin Wall while they build Walls against the victims of their imperial wars. Apart from the hypocrisy of Western officialdom, there is a political logic guiding these policies. 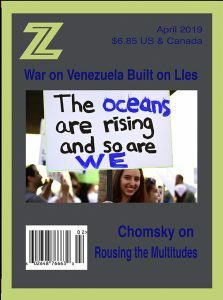 The West’s criteria for deciding which Walls are worthy of support and which Walls should fall, runs along the following lines: walls that keep out victims of imperialist wars are progressive and necessary for national security; walls that protect communist, nationalist, or leftist regimes are repressive, dehumanizing, and must fall. If we consider the larger political consequences of an event, like the fall of the Berlin War and the subsequent arbitrary annexation of the East, it is clear that re-unified Germany’s exercise of power has had a profoundly negative impact on the economies of Southern Europe and has concentrated dictatorial political powers in the hands of German decision-makers operating through EU headquarters in Brussels. Unified Germany has renounced its passive role and re-asserted its role in world politics, slowly at first as a passive junior partner to U.S. imperialist wars in the Middle East and now, more decisively, by linking up with Ukraine rightists and thugs and imposing economic sanctions on Russia. Germany’s great fall after World War II required a half century to “put all the pieces together again.” But once in place, Germany seeks to project world power, particularly through its proxies in the EU and NATO, in alliance with U.S. imperialism. The Fourth Reich increasingly looks back to the Third Reich.